Poison drummer Rikki Rockett is sharing an update on his health status one year after undergoing an experimental treatment for oral cancer. Following a 2015 diagnosis, the rocker initially received standard radiation and chemotherapy treatment before checking in to Moore’s Cancer Center at UC San Diego, where he received experimental cancer immunotherapy. "One year ago today, I started a clinical trial for immunotherapy one week after my daughter Lucy's third birthday,” writes Rockett on his Facebook page. “I was faced with oral cancer that was not responding to radiation or chemo. 1) Have surgery that would render me unable to ever speak again. 3) Try a clinical trial of a new drug combination of immunotherapy. However, if it didn't work, it might be too late to change course and save me. "I rolled the dice and began a trial at UCSD Moore's Cancer Center led by Dr. Ezra Cohen and Dr. Sandip Patel. Leaders in the immunotherapy field. Dr. Cohen was the lead [doctor] for head and neck cancer,” he continued. “I was more scared than I have ever been, but nine weeks later when I got my first PET/CT/MRI, the cancer had shrunk over 90%!!! A mere nine weeks later, I was 100% cancer free on July 13th, one day before my son Jude's seventh birthday. "One year later, I am still cancer free and preparing for the Poison 2017 30th-anniversary tour,” added Rockett. “I have Dr. Cohen, Dr. Patel, Tony Le, my amazing girlfriend Tc Smith, my friend Cortni Miller and the all the fantastic staff at UCSD Moore's Cancer center and, last but certainly not least, God to thank. My little girl Lucy would touch my neck and say, 'All gone, Daddy' almost every day. 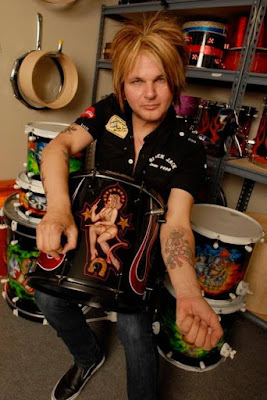 It was gone…"
Rockett and Poison are regrouping for the first time in years to play shows across North America with Def Leppard and Tesla this spring. The group will also perform their own concerts along the route, marking their first headline dates in more than a decade.